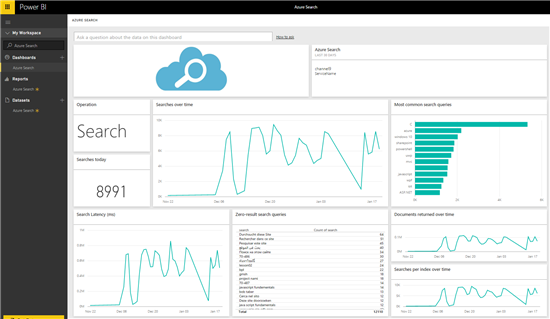 Azure Search Traffic Analytics allows you to monitor and understand the traffic to your Azure Search service. 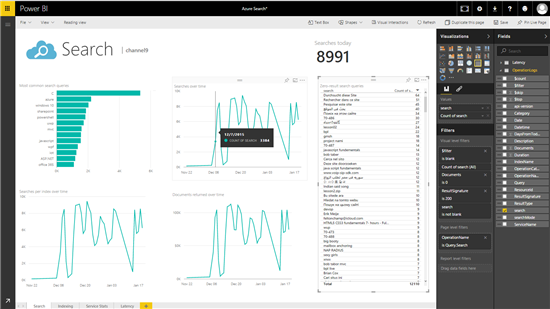 The Azure Search content pack for Power BI provides detailed insights on your Search data, including Search, Indexing, Service Stats and Latency. Connecting Power BI to your Azure Search analytics storage is easy and the analytics will include metrics from the last 30 days for you to explore. This post will explain how the Power BI content pack can help you explore your Azure Search data. For additional details, please see the Azure blog post or the Power BI help page. 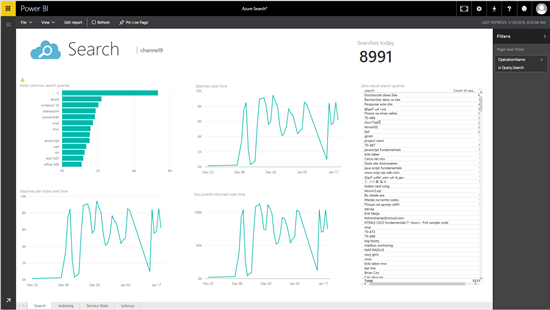 Once you’ve enabled Azure Search Traffic Analytics on your Azure Search account, you can connect to the Azure Search content pack for Power BI. After providing the storage account name and your credentials, Power BI will start loading a dashboard, report and dataset customized for Azure Search data. From the out-of-box dashboard you have the ability to select any of the tiles and further drill into the 4 pages of reports.For example, selecting tiles around the Search operation will provide more details about the Search activities in your account. Once you are on a report you have the ability to hover over the visualizations to see additional details. In each reports you can switch to edit mode where you can edit or add additional visuals to your reports. Selecting a visual will show more information about the data behind it. From any of the reports you can pin the visualizations or tiles to the dashboard by hovering over it and selecting the pin icon. You can add new tiles or move existing tiles to customize your dashboard. The question box at the top of the page also allows you to ask natural language questions and get analytic results, try selecting the question box for suggestions or just start typing a question such as “count of search by date”. After the initial import, the dashboard and the reports continue to update daily. You can control the refresh schedule on the dataset. 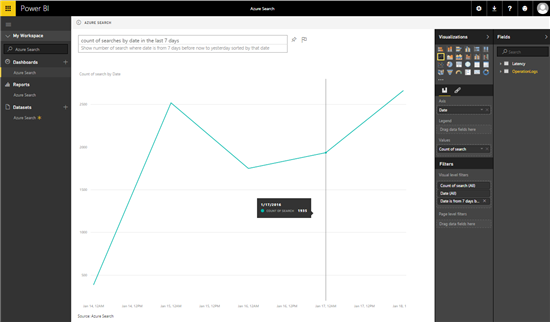 With the Azure Search content pack for Power BI, you have an initial set of metrics and insights enabling you to explore your data even further.